Wrangler® Boys Long-sleeved Dress Western Solid Snap Shirt looks sharp and feels great. This Long-sleeved Dress Western Shirt is a timeless classic! Whether it's dressing up for church on Sunday, spiffing up for a special occasion or a father / son bonding weekend.... your child will look sharp and feel great all day long in this Wrangler® Dress Western Solid Snap Shirt. It looks good with everything from jeans to khakis, and is constructed of 55/45 cotton / polyester that's so incredibly soft, your son will want to wear it every day of the week! 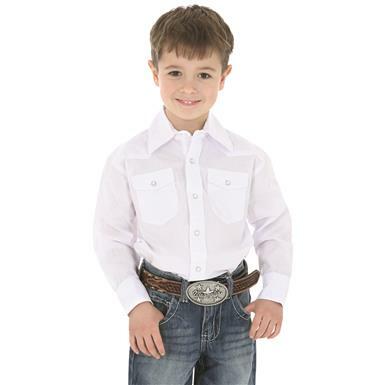 Wrangler Boys Long-sleeved Dress Western Solid Snap Shirt, White is rated 5.0 out of 5 by 2. Rated 5 out of 5 by jw5346 from Perfect white Western shirt Bought this for dance and it fits my son well and meets our needs perfectly. And the price was right! Rated 5 out of 5 by Hrsymom from Love this shirt Great all around shirt . Our son loves it and picks it out to wear whenever he needs to dress up.